Career planning & Development cell was established in the year 2003. 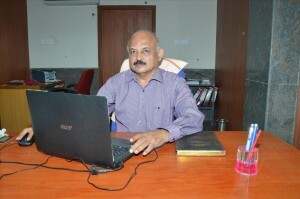 CPD Cell is headed by Prof.R.Ravikumar. He has obtained his B.Sc degree and Masters degree in Social work specialized in Personnel Management, Industrial Relations and Labour welfare from University of Madras. He has also obtained his Masters degree in Business administration from REC, Trichy, Bharathidhasan University. He has worked for more than 2 decades in different industry verticals in the fields of sales & Marketing, human resources Management and training & placements. The industry verticals include software, Health care, consumer durables and industrial products marketing. Expert Knowledge in product Launching, channel building and development, sourcing channels and recruitment techniques adopted by various software industries in India fresher’s hiring. Life Member of ICSW (Indian council for social welfare). The placement record of the Institution has been appreciable from its inception. The ultimate objective of the Cell is overall development of the students through rigorous training in order to make them placement ready which in turn will lead to quality placements. With this in mind the Cell regularly organizes Personality Development Programmes. Regular training is also imparted on aspects such as Group Discussions, Aptitude Tests and Mock Interviews. Our Institution is an Accredited Institution by TCS iON for conducting Online Tests for AIEEE,JEE,GATE, AIIMS, Metro Rail and Nationalised Banks. MOUs have been signed with CSC,TCS Ion, Monster .com ,Campus Interaction & Freshersworld.com. We are an Accredited Institution by the Indian Navy for Preliminary assessment and shortlisting for Service Selection Board (for Military Services) which is a regular annual and continuous Programme.